Wow! This is a true monumental size sculpture here! 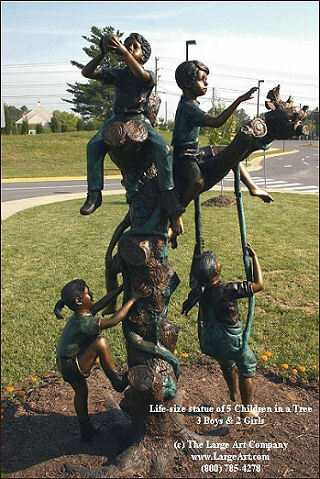 Count them, 5 children playing in a tree and cast in pure bronze to last for hundreds of years. Standard, this sculpture comes as 5 boys. However, we can customize to replace 2 of the boys with girls (as show). Also, the ball and bird can be brown (as shown) or white. Also, the swing actually moves. However, we can weld that tight so it will not move as well. Measures 93" tall by 54" deep and 52" wide. Mounting nuts can be welded under the base for secure installations. We have these cast ourselves using high quality American bronze. This sculpture would look great in a garden or park or at a school, library or other public venue. It is intended for outdoor display and will last for hundreds of years with little maintenance. For more information about care and cleaning click here. We love working with schools and your purchase orders and checks are accepted. Please specify when ordering. Measures 93" high by 54" long and 52" wide. Weight approximately 650 lbs.